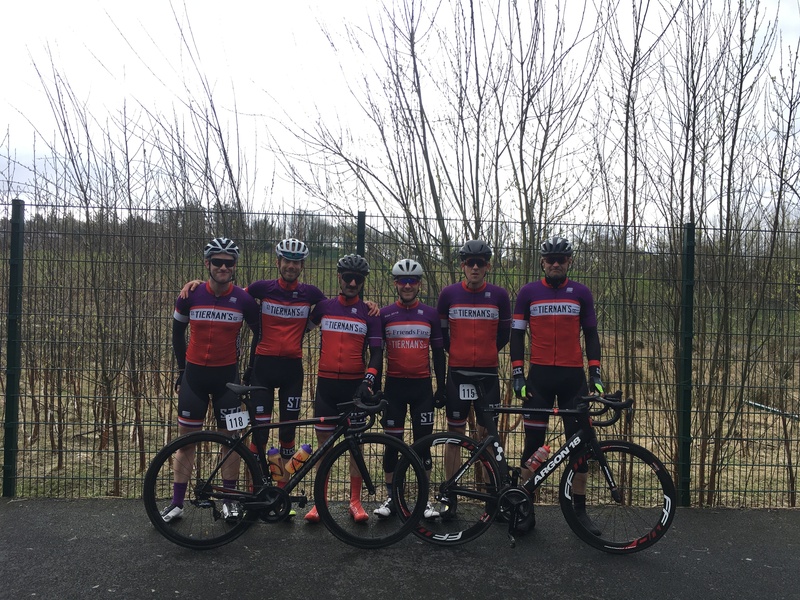 With the Race Season well underway our Racing Secretary Micheal Stack sends us this report from our first stage race of the season. This is the first stage race of the season, and this year allowed A1 riders in which dismissed any notions of it being a ‘handy’ weekend in the west. Last year we did really well with a stage win and 2 guys on the podium at the end of the weekend, but it would be much harder this year. After a few miserable weeks of weather in March, the forecast for the weekend was good and everyone was mad for tar. We drew number 3 in the car draw which gave a great view of the racing as we headed along the main road to Leenaun and along the stunning Killary Harbour into Connemara. Kev was, eh, keen, and got up for third place in the first KOH – petrol money sorted after only 15k. A big crash in the middle of the bunch soon after brought down 15-20 guys, but luckily no sign of purple and red on the ground. The high position in the cavalcade meant the support car was called into action as neutral support and we sorted out a guy from Longford with a wheel – he promised to show up for the Laragh Classic in return! All riders stuck with the main bunch until we hit the loop around Tully Cross and Letterfrack where it got a bit hillier and riders were starting to get dropped. It’s short punchy rolling roads around here, rather than long climbs. When I passed Barry and Dermot they were driving a grupetto hard up one of the drags and burying themselves in the effort. Good, honest stuff from the lads. We passed through Leenaun again and it was really nice to see plenty of locals and tourists lining the road and cheering on the race. It’s back to Westport along the N59 again, and we had Peter, Tiit, Kieran and Kev working hard in the large main bunch chasing the break, and they all finished comfortably in this group, a minute down on the winner. Barry and Dermot rolled in a few minutes further back, shattered from their efforts. All riders back to the apartment for a few hours to shower, eat and prep the bikes for the Stage 2 TT. The downtime coincided nicely with the end of the Milan San Remo where the pros were racing up the Poggio (the real one) at the end of their 270km – all well and good but would Alaphillipe be able to dodge a stray sheep on a gravelly road in the Mayo crosswinds? The big question was: to TT or not TT? Some riders went up on their regular road bikes, some on road bikes with clip-on bars, and some on full TT machines. All riders managed to successfully take the left turn up the hill this year – marginal gains. Back to town and some of us went down to the local pub for some grub, where we tried to eavesdrop on the commissaries at the next table as they totted up the GC classification. Kieran was 9thon the stage and our highest GC man in 16thovernight, with Peter not far behind in 20th. Weather looked cooler, wetter and windier as the lads fuelled up with their various different personal porridge concoctions (I counted 5 different types of porridge in a 4 person apartment, go figure). 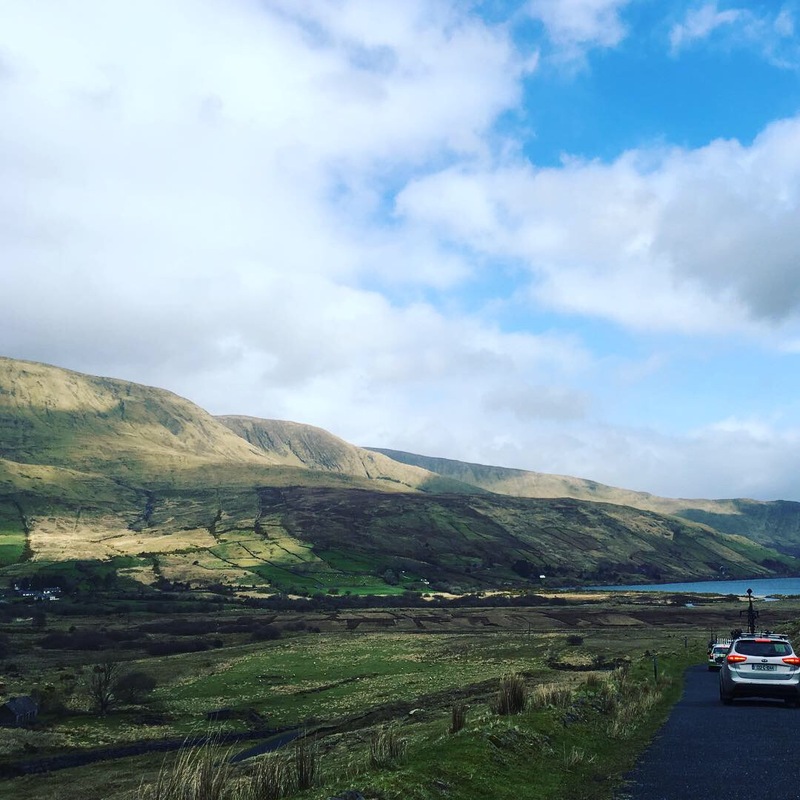 This route is a new one – again some stunning scenery around Doolough, Killary and Lough Melvin in particular, not that any of the racers would be enjoying it. It was a headwind to Louisburgh and then a left turn into a climb and a brutal crosswind, and riders with heavy legs after yesterday were starting to feel it and get distanced. I picked up Dermot along this stretch and was glad to have him as shotgun for the rest of the stage to offer gels, bars and bottles to anyone who needed it, and also take some photos of the scenery! There were little groups all over the road at this point, and we met Barry next giving a tow to a rider by the name of Dumoulin. We gave them a tow on the bumper for a bit and then left them at it, Barry happy to plough on and eventually form a small group who battled together in the wind to finish the stage – solid work on a day when the broom wagon was busy and there were quite a few DNFs. We moved up until we found Kieran in a group chasing the main bunch, again happy with enough food and water. Some dodgy descents meant there were a few crashes along this stretch but again all our guys stayed safe. That meant that we had Kev, Peter and Tiit in the yellow jersey group, which was now down to about 20 riders, chasing around 10 riders up the road. 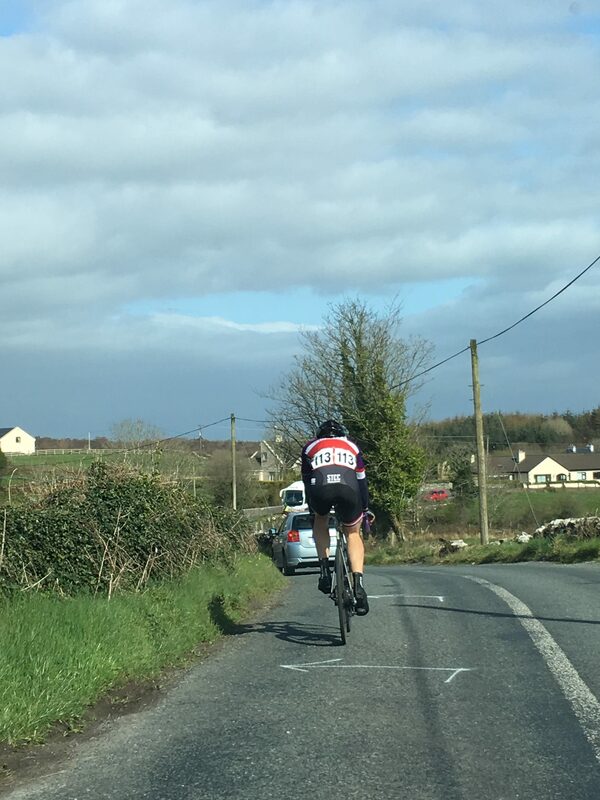 We had a great view from the car of the last 30k run-in to Westport, and the lads did some really aggressive racing at the front of this group, catching a small break and then launching a few attacks of their own. Peter had a puncture with around 15k to go, and we sorted him out with a new wheel and helped him chase back to the group – super work from him given that he also had a loose saddle and was finding it hard to sit down, and it was worth the effort as it meant he kept his GC place in the top 20 at the end of the weekend. Tiit went long with an attack around 10k from home, and it looked like it might work but he was eventually caught. Then it was Kev’s turn to launch a solo attack with 3km to go – ballsy stuff for an A3. Some good teamwork saw Peter and Tiit move to the front of the bunch and snuff out any potential chasers but there were too many and Kev was gobbled up with around 300m to go. At the end of the weekend, Kev won top A3 and Peter was the highest STCC on GC in 18thplace, and we were 6thin the team classification. A solid outing and great training for Ras Mumhan in 4 weeks time. Many thanks to our hosts Covey Wheelers for yet another excellent weekend of racing. No Replies to "Ras Mhaigh Eo 2019"